Looks tacky with its faux metal trim and shiny white plastic casing. Display is bright, but lacks adequate contrast; dark colour tones appear a bit washed out. Lacks 3G support. Just 256MB RAM makes it sluggish; painful lag in basic operations like call handling, listening to music and text input. Any game with a hint of dynamic graphics brings the A24 to its knees. Camera suffers from a delayed shutter release; photos lack sharpness. Thankfully, voice call quality and overall network coverage are good. Verdict: The A24 falls short on looks and performance. You are better off considering the other handsets that have been reviewed here. Good build quality; stainless steel back cover and backlit touch buttons. 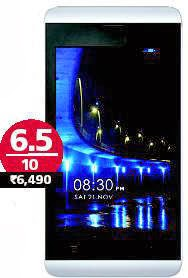 5-inch screen is capable of good colours; 720p videos run smoothly and without hiccups. Audio is loud and clear on headphones, but speakers sound low; call quality, although passable, is not very crisp. Runs casual games like Temple Run, but demanding offerings like Dead Trigger play with stutters and lags. Lacks 3G support; slow internet browsing speeds make the device seem even more sluggish to use. Screen is plagued by limited viewing angles and slow touch response. Poor camera: photos lack details and colours seem dull. Video performance is similar. 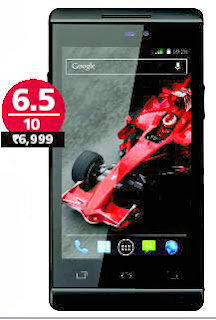 Verdict: The Karbonn A26 promises a lot with its big 5-inch screen and dual-core processor but doesn't deliver. Lack of 3G connectivity, a poor camera and a less-than-perfect touchscreen prove to be deal breakers. Battery life at 16 hours is good, but this is at the cost of 3G support. 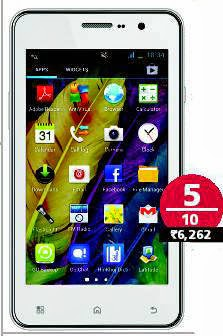 Buy A26 only if you must have a 5-inch screen as well as access to Android's large app ecosystem. Handles productivity tasks, web browsing, and casual games like Angry Birds smoothly. Supports most audio and video formats; and even 720p HD resolution. 5-inch display allows for comfortable typing; but legibility is routinely marred by its reflective surface and abysmal viewing angles. Loudspeaker, although audible at low volume levels, lacks quality. Camera app sports an intuitive user interface and image filters; output is decent enough for photo apps like Instagram, but don't expect family album-quality captures with this shooter. Comes with apps like Kingsoft Office, Nimbuzz and Opera Mini. Touch response is erratically sluggish at times. Poor mic placement results in weak voice pick-up. Verdict: Bad placement of the Maxx's microphone affects call quality; something that could possibly be overlooked if you use a Bluetooth earpiece. The A50 is not equipped for resource-hungry 3D games, but works well for everyday tasks; besides, it comes with a large-enough battery that lasts a work day - as well as a fully-functional office suite. 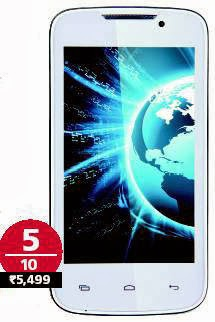 Buy this device only if you want a 5-inch display in budget pricing. Premium build quality; it almost looks and feels like the BlackBerry Z10's younger sibling. Touchscreen responds well to taps and swipes; handset performs smoothly even when you're running multiple apps. Games like Redline Rush play without hiccups at highest settings. Handles almost all video formats; HD video playback poses no hassles. Display suffers from bad viewing angles, but look at it from the front and it is capable of rich colours with nice blacks. Audio output lacks warm bass; the handset works well with the bundled headphones only. Keys on the edges of touch keyboard do not register correctly; third-party apps offer a better typing experience. Camera clicks photos with a fair amount of detail and bright colours, but don't expect point-and-shoot quality. Recorded 720p video clips are passable. Verdict: The A500S is a nice combination of budget pricing, good build quality and capable hardware. If you're willing to overlook a weak antenna that could lead to call drops in low network areas, and a slightly erratic touchscreen keyboard, then this is a good Android device to pick at its price. Smooth user interface; casual games run smoothly. Touchscreen is responsive, and display is capable of vibrant colours; readability suffers in bright environments. Touch buttons under the screen are slow to respond. Music playback is loud with headphones, but speakers sound shrill. Volume during calls is on the lower side, but is adequate. 720p videos are handled without any problems. 11 hours battery when used with a 3G connection. Camera output is decent, but lacks detail. Verdict: The Cloud Y2 promises lag-free performance for most part; its screen is capable of good colours and the camera shoots clear images in good light. 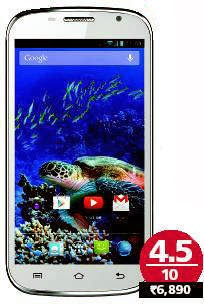 Overall, a very good choice for consumers looking for a budget Android phone. Pocket-friendly form factor; included silicon case gives it much-needed grip. Display is crisp and colours are vivid, but it suffers from a marked reduction in clarity when viewed at an angle. Touch response is average and its virtual keyboard lags noticeably. Scene presets are few in the camera app and videos are recorded in the dated 3GP format. Medium quality movies, including MOV files play without a fuss. Loudspeaker is powerful. Though it lacks bass, it is reasonably clear enough for group listening. Phone slows down drastically when running multiple apps in the background. 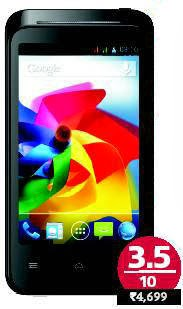 Verdict: Buy the Lava 3G 402 if you are looking for simple design, good build quality, decent display with a powerful audio output. But the intermittent slowdowns caused by multiple apps in the background is something you should be forewarned about.